Mourners have gathered at a Moscow River bridge to commemorate opposition politician Boris Nemtsov, who was killed at the spot 40 days before. Five people suspected of the assassination have been arrested so far. Hundreds of people flocked on Tuesday to the Moskvoretsky Bridge just a stone’s throw from the Kremlin, where Nemtsov was gunned down on February 27 evening. They are laying flowers, light candle and hold portraits of the slain politician, whose assassination was the highest-profile murder in Russia in years. 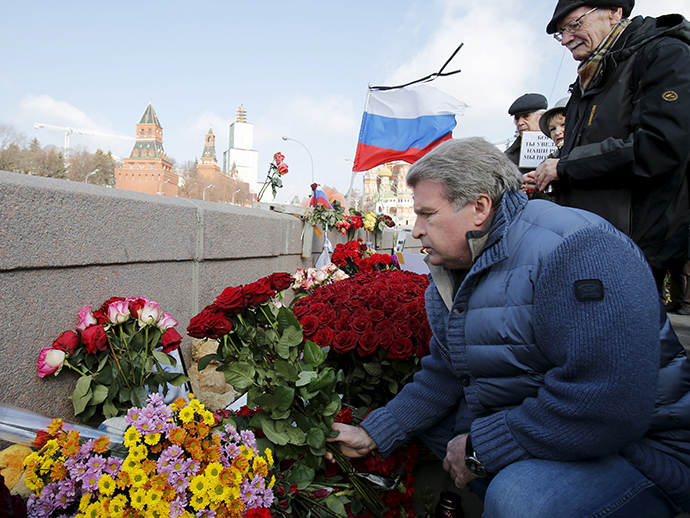 Another mourning ceremony was held in Yaroslavl, where Nemtsov served as a regional parliament member after winning a seat in the 2013 election. Supporters gathered at his home in the city. 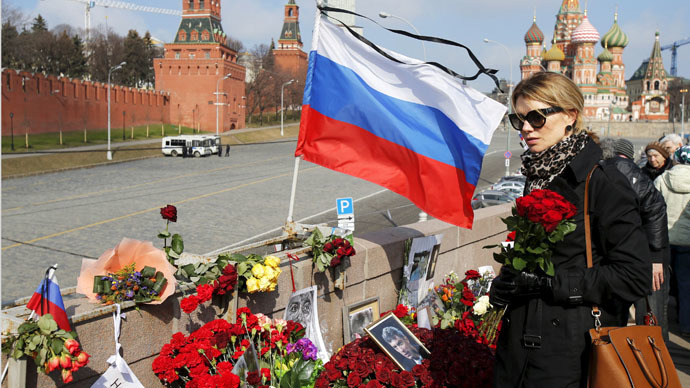 Nemtsov’s friends and fellow politicians are calling on the Moscow city council to rename the bridge after him. The site sparked controversy in the past weeks after activists accused the city authorities of demolishing an improvised memorial that was placed there in the wake of Nemtsov’s death. The city services said they merely cleared away flowers and damaged memorabilia and that new ones can be placed there by those wishing to do so. Russian law enforcement have arrested five people suspected of killing Nemtsov, all of them from the turbulent predominantly Muslim Southern Russia. One possible motive for the crime is believed by investigators to be revenge over Nemtsov’s statements in the wake of the Charlie Hebdo massacre in France, which the suspects supposedly viewed as an offense to Islam. The investigation into the killing is still under way. Holding a memorial ceremony on the 40th day after a person’s death is a tradition observed across Russia. It is rooted in Orthodox Christianity and the Biblical account of the ascension of Jesus on the 40th day after crucifixion. The memorial is also often observed by non-believers and is part of Russian culture.